The year has started well with a number of opportunities to collaborate on very worthwhile community art projects. I’ve also been once again inspired by a number of artists featured in galleries and exhibitions. 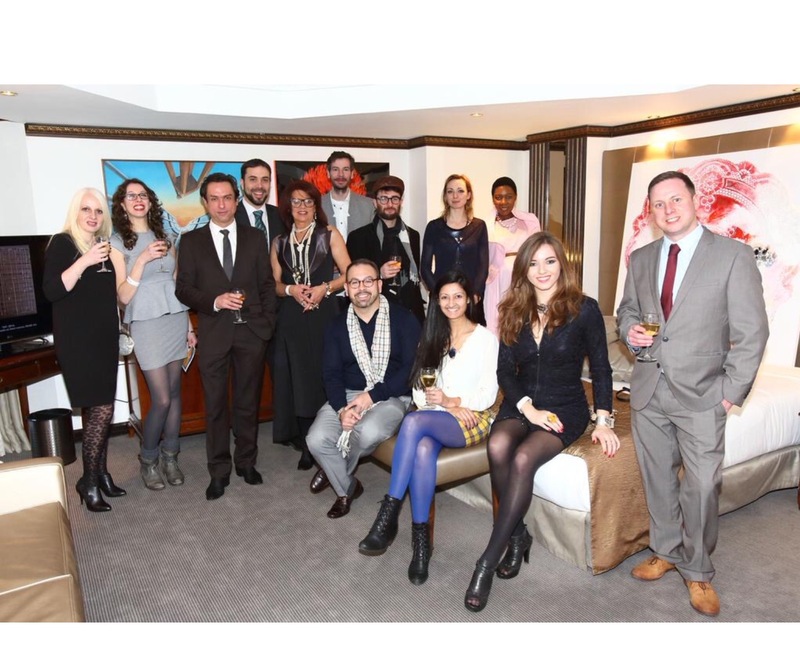 This included the recent Artrooms event at London’s Melià White House Hotel. One of the artist groups to feature in the show was The Cult House, a newly formed collective based in London and pioneered by Brazilian born JA Neto. I’ve been closely observing the Cult House’s activities over the last year, struck a rapport with a number of its artists and look forward to seeing its rise during 2015. Why did you start the Cult House? I tried to get out of the business world for while but, since living in London, I’ve recognised the massive interest and potential of public art events. Pretty much everything happens here. I found myself as part of an audience and not playing a decisive role in any of the art fairs and events platforms. I decided to create one that suits myself and serves all kinds of audiences- one that exists without the need to be part of an existing art collective and one that is fully accessible to the public as a whole. That is what The Cult House is progressively creating. How do you distinguish yourself from other organisations and initiatives promoting art and artists? We do not pick the artists based on what we can take from them or their style or art fields. The community is designed to help celebrate and spread art to a wider audience. We want artists willing to join our group to grow with us. Our criteria is very simple – if you are serious with what you are doing and working hard towards that, you can join us. We will help as much as we can, particularly if it is beneficial to promote what you’re doing for the whole community. Progressively we are organising and partnering with different groups to create a variety of events from popup shows and exhibitions to music events and art fairs. You can check some of them on our website past events tab, where our artists are encouraged to participate and at the same time to build their own network. This is proving to be a fantastic formula. Immediately after our events we can see on our social media channels the interaction between the artists and the results of what they learn from each other. It’s very rewarding and gives us a solid base to keep going and develop more and better events. Much has been said of the modern art and the industry. What’s your overall opinion on the industry, particularly in the UK? This is a never-ending subject but in my opinion there are places for everybody in the industry! The goal is always to put the art out there, making it accessible to audiences and to give the opportunity for artists to be able to create more and more art! It doesn’t really matter where or if it is for a selected group because in this society people will always find their special place! The UK art scene is centralised in London and a few other cities like many countries. The good thing here is everyday you’ll find new groups/activities/artists/events trying to get their ‘place in the sun’, making it possible for artists to survive and improve their work. The UK government has many ways to help and support good initiatives but it is not easy! If you have a dream and work hard towards that, in the UK there are more opportunities than in many other countries to succeed! What are your plans over the next 5 years? That’s a lot to answer but I will try to make it simple. We will soon celebrate our first year with so many success stories during this period; two pop up shows, our participation at ArtRooms,130 artists from 12 different countries, music events and our first collective exhibition coming out soon to close this first year! Watch this space! All those achievements have come without people asking what exactly are we doing; They’re simply trusting and willing to be part of a new movement. Now we are moving to a second stage of our project with the ultimate goal of making The Cult House a strong enough platform to make the difference in many artists life’s, careers and communities. In the mean time we will keep building our community, promoting art and artists, creating a range of pop up shows and collective exhibitions taken nationwide. For further information please visit The Cult House website.